A tour for families around the area of the celtic settlement near Oberursel is being held on Sunday, 7th September, 2014 at 2pm. The tour starts at the Taunus Information Centre and costs €3 each for adults and €1 each for children. Those taking part should have sturdy footwear. 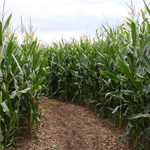 The Maislabyrinth – a maze made out of maize – will be holding a Tractor Oldtimer Day on Sunday, 7th September, 2014. 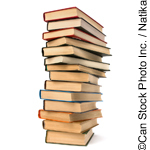 There will be a book flea market in Oberursel’s library on Saturday, 6th September, 2014 between 10am and 1pm with proceeds going to the library’s supporters’ association. 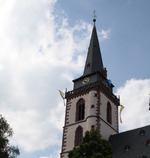 The tower of St.Ursula’s Church in Oberursel will be open to the public on Saturday, 6th September, 2014 between 3pm and 5pm. 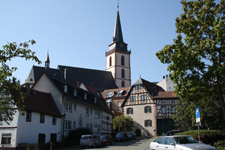 A tour of the old town (Altstadt) part of Oberursel is being offered on Saturday, 6th September, 2014 at 2pm. 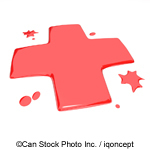 Blood can be donated at the Red Cross in Oberursel on Friday, 5th September, 2014 between 3.30pm and 8pm. The Red Cross is located at Marxstraße 28, opposite the U-Bahn station “Lahnstraße”. If you walk through the Adenaueralle this and next week, you will probably notice the colourful construction trailer parked in the middle of it, where the flea market stands normally are. The trailer is part of the project “Café Zugvogel” – literally, the migrating bird café- which has been arranged by the centre for advising youths and addiction in Hochtaunuskreis. After spending two weeks each in Bad Homburg and Kronberg, they are spending the last two weeks of the summer holidays in Oberursel. 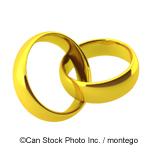 Congratulations to Rolf and Waltraud Huyer in Bommersheim who are celebrating their Diamond Wedding Anniversary today! As part of the Orscheler Sommer events the film “Le Harve” will be shown at the Rathausplatz on Saturday, 30th August, 2014 at 9.30pm. 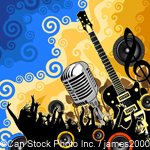 A gospel concert is being held on the Rathausplatz on Friday, 29th August, 2014 at 7.30pm. The Frankfurter Gospelchor will be singing from their repetroire, including “oh Happy Day”, “Kumbayah” and “Go Tell it on the Mountain”, accompanied by pinao, percussion, bass and saxophone. The event is part of the Orscheler Sommer organised by Kunstgriff e.V.